Apple on Wednesday issued its annual Supplier Responsibility Report, covering a range of issues from factory overtime to the environment, including new rules for factories wishing to be a part of its global supply chain that prohibit those firms from charging "recruitment fees" to employees. Recruitment fees have long been a point of contention in the supply chain, as they can quickly add up to a significant chunk of a worker's yearly pay. Apple had previously banned factories or recruitment agencies from charging more than one month's fee— requiring that any excess be repaid to the worker. Apple's manufacturing partners refunded $3.96 million to workers last year, up slightly from the $3.9 million suppliers paid in 2013, according to the report. Nearly $21 million has been sent back to over 30,000 workers since 2008. "That fee needs to be paid by the supplier and Apple ultimately bears that fee when we pay the supplier and we're OK doing that," Apple operations chief Jeff Williams told Bloomberg. "We just don't want the worker to absorb that," he added, before calling the practice "in essence bonded servitude." Apple conducted 633 supplier audits in 2014, a 40% increase. Williams said that all cases of excess recruitment fees in 2014 were from newly-audited suppliers, and the company found no repeat offenders. He also noted that some of Apple's partners balked at the idea of paying the fees themselves, but Apple refused to back down. "Every year we raise our standards and we look for opportunities that will either make things simpler or, for places where we feel like we need to be, more rigorous," he added. Apple also reported progress in its fight against conflict minerals, which the company called out in the same report one year ago. Of the 225 smelters which supply Apple with products containing gold, tantalum, tin or tungsten, 135 were audited and found not to use any materials from war zones. A further 64 smelters will allow audits in the future, and just 26 new smelters have yet to acquiesce. 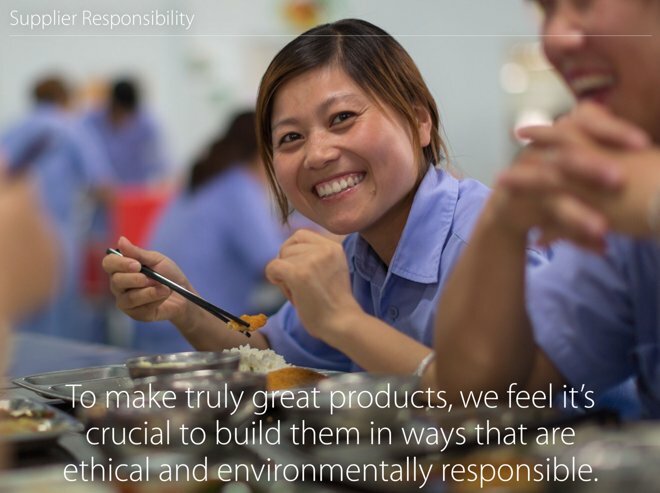 Each of those in compliance is certified by the Conflict-Free Sourcing Program, of which Apple is a member. "The approach is working," Williams said in a separate interview with the Wall Street Journal. "Our strategy here is to work with as many smelters as possible." Workers' shift hours, one of the more closely-watched issues in Apple's supply chain, is also among the hardest to police. Apple reported that, on average, 92 percent of workers were at or below Apple's 60-hour cap on working hours in 2014. That is down slightly from the 95 percent of workers that Apple reported in 2013. On the environment, Apple said that it had expanded the Clean Water Program to cover 50 percent of the total water withdrawal for its top 200 suppliers. Reuse and recycling programs led to a half-billion gallon savings on fresh water usage for 13 of Apple's largest suppliers. The company also remediated 59 environmental violations at 35 supplier sites listed in the Institute of Public and Environmental Affairs database. Apple's Supplier Employee Education and Development program, which provides educational facilities for factory workers, now has 48 classrooms at 23 factories. The program is free of charge for workers, some 379,000 of whom took advantage of it in 2014. The company also reported the training of an additional 2.3 million workers on their rights in 2014. More than 6.2 million have passed through the program since its inception. In all, Apple conducted 633 audits covering 1.6 million workers in 19 countries in 2014. The company also contacted some 30,000 workers individually to confirm its observations.